COLLAB: Birch & Pine Quilt — Vacilando Quilting Co. 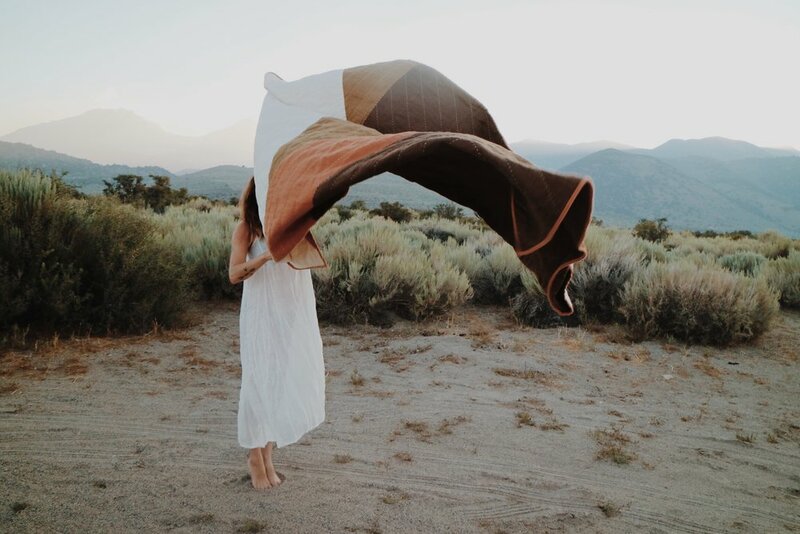 The second piece in the Vacilando x Designer Collaboration Series, the Birch & Pine Quilt was created over five months in a long-distance collaboration with Kate Oliver of Birch & Pine and The Modern Caravan. I've long been an admirer of Kate's words, photographs and aesthetic, not to mention her openness, fortitude and drive that makes every project she embarks upon a real treat to follow along with. Whether it's her thoughtfully designed interiors she creates as one half of The Modern Caravan, the beautifully authentic words and photos of her daily life shared on Birch & Pine, or her keen eye for minimal, warm aesthetics that she curates on both, Kate is a talent I feel truly lucky to work with. I meet Kate and Ellen after we had first moved to the Bay Area in 2015, while they were traveling for six months in their first Airstream. They were passing through San Francisco, heading south after a whirlwind summer spent caravanning through Alaska with some of our mutual Airstream friends, and ended up staying at the "campground" (ahem...parking lot) we were in for a couple days. As with most Airstream folks, we made fast friends and spent our first evening together drinking whiskey and trading stories from the road in their first renovated home on wheels. The next day, we met them at a beach south of Half Moon Bay for an idyllic sunny afternoon frolicking in the surf, drinking beers and getting to know each other, followed by dinner at our favorite hole-in-the-wall burrito spot. We've stayed in touch since then, watching each other's lives through little square photos on Instagram. They moved to Indianapolis, built a stunning new Airstream home for themselves and subsequently started their own business building Airstream homes for others, while we lived by the ocean in Northern California and then left to spend the year in Texas and build our own Airstream home with inspiration and guidance from Kate and Ellen. 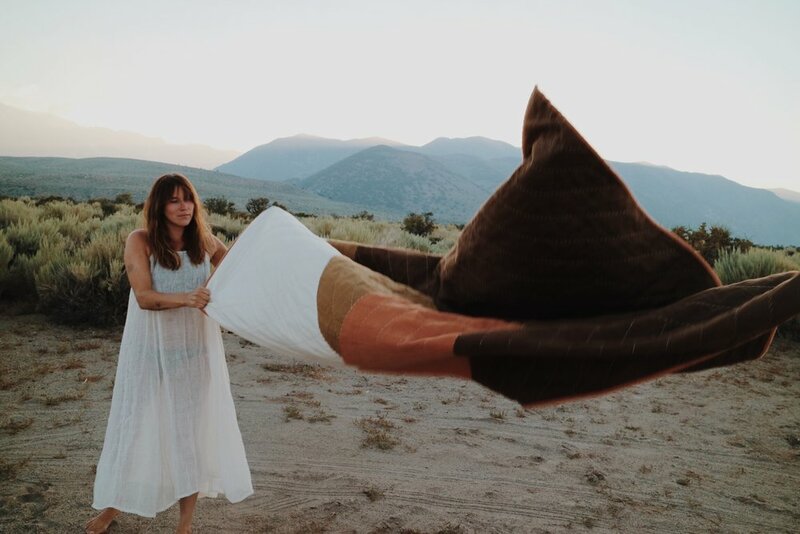 When I reached out to Kate to work together on a quilt collaboration, it was no surprise that she had a beautifully descriptive and evocative story about an evening spent watching the sun set behind the mountains at a campground in British Columbia, a moment that she often recalls with the fondest of memories. She shared this photo and her recollection of that evening below - inspiration for the Birch & Pine Quilt. There is a campground we went to in British Columbia called Goldpan. There are fourteen sites, and fills quickly - yet we were able to get a spot both on our way to and coming back from Alaska just stopping in late in the day. When I think of our time spent traveling, I think of the first night we spent at Goldpan. I was entirely unaware that there was any desert in British Columbia, and there we were, staying in it. The wind funneled through the river canyon and felt like a giant blow dryer...just this crazy warm, dry wind that didn’t stop all night. The rush of the river was constant, and the sounds were...I don’t know...the most soothing thing I’ve ever heard, even the trains that ran all night and echoed against the rock. Whenever I’m having a hard day, I think of camping there and feel immediately at ease. I took some time in the evening to sit by the river and there were a lot of things that I sorted through there. Things from my past I’d long suppressed, not necessarily easy things to muddle around in and out of, but things I needed to identify and forgive myself for. When the sun set, as I was sitting on the rocks down by the water, the colors were - as desert colors are at sunset - soft and muted, but there was this line of light that cut through the mountains and across the river. I have a photo of it. It was the most beautiful thing I’d seen in my life - it wasn’t necessarily breathtaking, it was yet another mountain view and was obstructed by big white RVs, but I’ll never forget it. I would like to take that line and those colors - the inky sky, the muted browns, the dusty end of day light washing over everything - and create a quilt with you based on that. I envision several thin lines, perhaps meeting and then diverging, but still very geometric and neat. With that story and sentiment in mind and a rough sketch, we abstracted the mountains and the beams of light, using rich warmly colored Belgian linen to differentiate each element and rows of hand quilted stitches to create movement and direction. The resulting piece is comfortable yet modern, simple but visually interesting. The Birch & Pine Quilt is a limited edition of four quilts and handmade in Texas by Laura.